EasyXLS™ library allows you to export data to XLSX file format. The data in cells can be formatted using predefined formats or user-defined formats. EasyXLS can be successfully used inclusively to export large XLSX files having big volume of data with fast exporting time. The below example is a common code about how to export to XLSX file. After that, more code samples about exporting data from various standard data structures like DataTable, GridView, DataSet and ResultSet are shown. Me.Label1.Caption = Me.Label1.Caption & vbCrLf & "File successfully created." The screen shot below represents the exported data to XLSX file generated by the code sample above. The file has two worksheets (First Tab and Second Tab). The values and the data type of the cells from the first worksheet are set. EasyXLS allows exporting DataTable to XLSX file with formatting. EasyXLS allows exporting GridView to XLSX with formatting. EasyXLS allows exporting DataGridView to XLSX with formatting. EasyXLS allows exporting DataSet to XLSX with formatting. EasyXLS allows exporting ResultSet to XLSX with formatting. How to export ResultSet to Excel in Java? 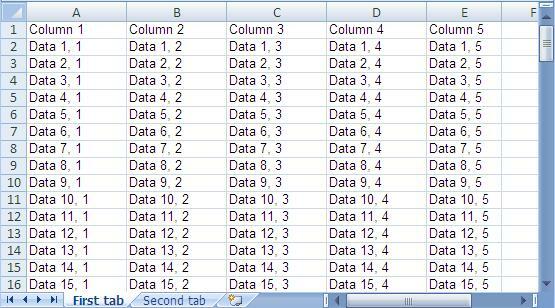 EasyXLS allows exporting a list of data to Excel with formatting. EasyXLS allows exporting DataGrid to XLSX with formatting.